A few weeks ago, I realized the next game I had penciled into the calendar was at Dodger Stadium in July as part of a family vacation. As a result, I found myself itching to go to a Nationals game, but I don’t have a driver’s license, and my dad was going to be out of town during this week’s homestand. 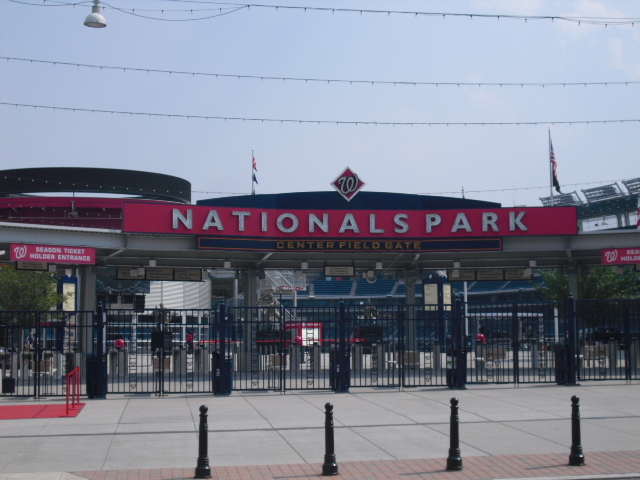 So I proposed to my brother, who does have a license, that we spend a day in D.C., just an hour north of my residence in Virginia, and attend a Nationals game. I picked Thursday, June 21st, for a few reasons. 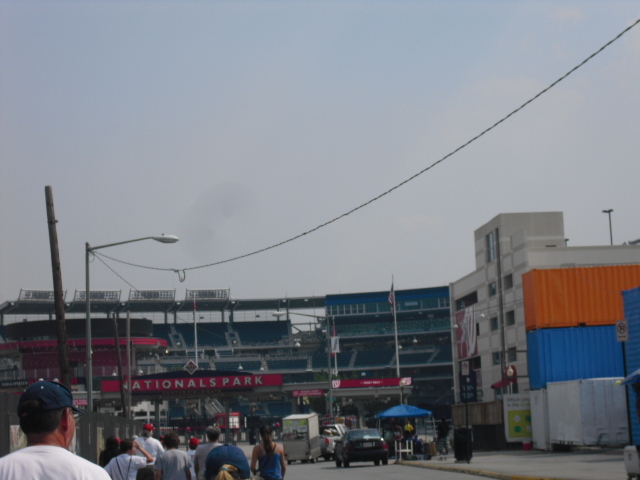 1) I realized I did not have anything to do that day, 2) it was a night game (almost certain BP), 3) a weekday game, and 4) it was after the popular Yankees-Nats series, so the crowd size would likely be manageable. It didn’t stop me, though, from wanting to get to the Park by 4:30 to get maximum batting practice time. And thank goodness we did get there on time. We ascended from the Navy Yard metro station onto Half Street at about 4:00, and killed a few minutes “browsing” in the gift store in centerfield, in reality we were taking advantage of the air conditioning. 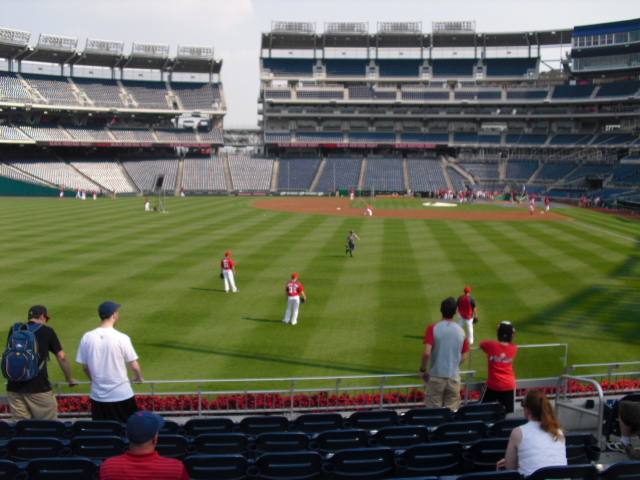 At 4:30, I waltzed on in and found a nice, empty-ish section in left field. Unfortunately, all the Nationals pitchers were in right field, just a few coaches snagging flies in left. But I quickly recognized Bo Porter, the current third base coach for the Nats, and formerly for the Marlins, and I was able to get him to toss me my first ball literally a minute after entering the stadium. He was friendly, and later tossed up more balls into the crowd, but I was still the first, HA. The following two photos are of Bo Porter just after he tossed the ball to me, and then the ball in my glove. I enjoy catching home runs a lot more than getting toss ups. The latter feels cheesy and should be reserved to kids under 12 years old, which it is for the most part as players are much more inclined to toss to young fans. And catching a home run takes much more skill and makes me feel accomplished. 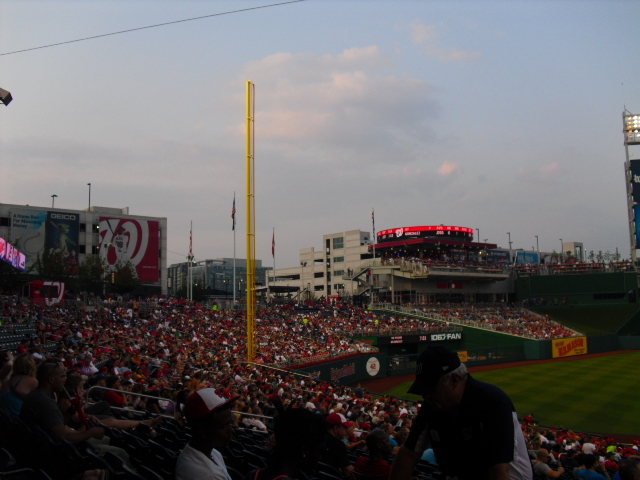 For some unknown reason, the majority of home runs during BP at Nationals Park end up in the Red Porch. Actually, the majority end up in the bullpen, but the catchable majority end up in the Red Porch. It is just a small section of seats in left-center, and it’s really nice because it is so much quieter than the big section in left field full of kids begging for toss ups and non-athletic chums thinking they can successfully barehand home runs, but only end up successfully getting in my way. So at the Red Porch it was myself, another young-looking ballhawk who I thought I recognized (I’ll get to that later), a middle-aged guy who I recognized from previous games as a Red Porch regular, and later a few people dressed in Rays gear came to snag at the Porch. As for the older guy, he was really nice. He caught the first home run hit after I got there and promptly gave it to a small girl in the front row who was there with her mom and brother. They all had gloves, and mom gave the ball back to the guy after she told him that the girl already had a ball. The next home run was a high fly that was going to clearly land in the section of the Porch closest to centerfield, I was the closest to it when it was hit, so I ran over and got into position just as the ball was descending. When they’re hit that high, it is hard to tell exactly which row to be in for an easy catch, and I ended up being one row too far back. But it didn’t matter because the other two guys who ran for it did not come close enough to catch it before it reached me. I reached over the row in front of me and caught it cleanly. Ball #2. Later, the older guy informed me it was Danny Espinosa who hit that ball. Probably not a minute later, another shot was heading towards the Porch, and at first I thought I had no chance to snag it. 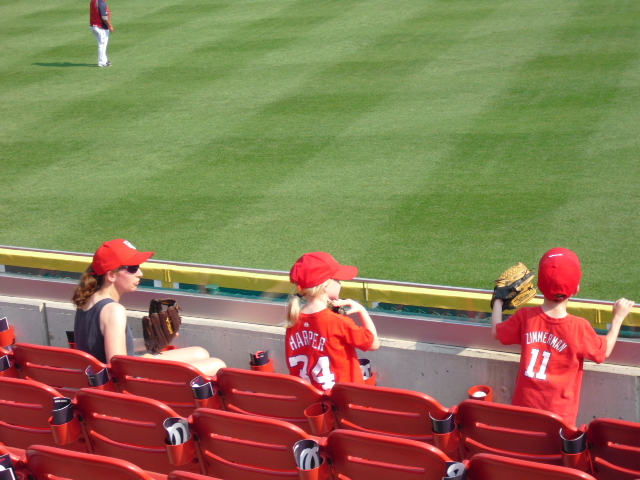 Nevertheless, I ran to my right, I was in the third row, and the lady (pictured with the two kids) in the first row reached up for it, but the ball cleared her glove by a mere inch or two, and smacked right into mine as I reached over into the second row. She let out and emphatic “Oh, man!” or something of the sort, when she realized she missed it by so little, and she was facing my right after I caught it. I took a quick peek at the ball and immediately decided it wouldn’t be polite to stick it in my pocket after I had done so with another not a minute prior, so I handed it straight over to her, and she accepted with a smile. Okay, the other kid who was ballhawking at the Red Porch looked familiar to me. I thought it might have been Mateo Fischer, a fellow blogger. And by golly it was. I introduced myself, and we talked for a few minutes. He is a friend of Zack Hample and writes a blog, Observing Baseball. He has commented on my blog a few times, and it was good to finally meet him. As he mentioned on his post about this game, we unfortunately forgot to get a picture together, but we’ll likely meet again. Back to ballhawking: I told my skeptical brother I was going to snag at least four balls at this game, and he didn’t believe me. He had seen me catch all three up to this point, so I just needed one more to shut his trap. This is where things got confusing and weird. Up to this point, which was probably around 5:15 or so, there had been people in right field snagging also. For at least the last two years (I believe) the left field sections, Red Porch, and the upper deck in right field were open for the first hour after the gates opened (at 4:30), and then all other gates opened at 5:30. 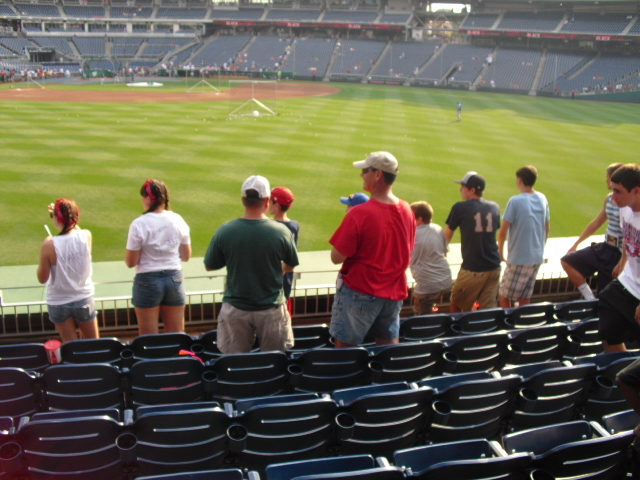 But the people in right field were in the lower section, which I previously thought was unavailable until 5:30. So I decided to go over there and check it out, but a guard informed me before I tried to enter the section that it was closed until 5:30. And since I didn’t feel like bickering, I turned and went on my way. But this made it more confusing: the escalator and stairs going up to the upper deck in right field, which I previously thought was open for BP, was blocked off. I still don’t know why the people in right field got special access, or why the upper deck was closed. 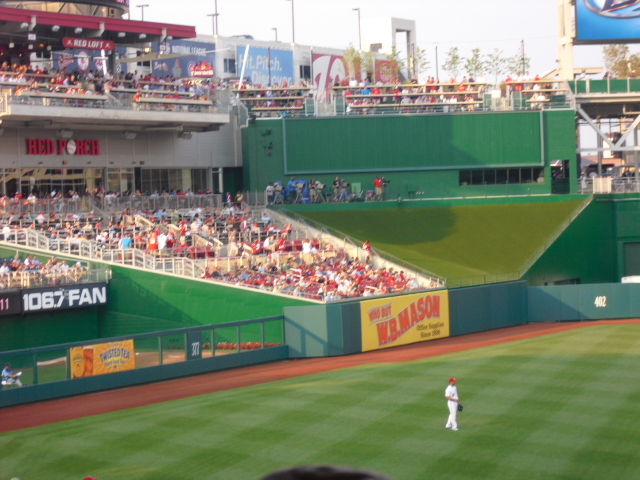 Oh, Nationals Park administration, thou art a fickle enigma. Within the next 20 minutes, I think I drank 4 full 16 oz bottles of water, refilling the one I brought with me at the water fountain. It was SO hot. 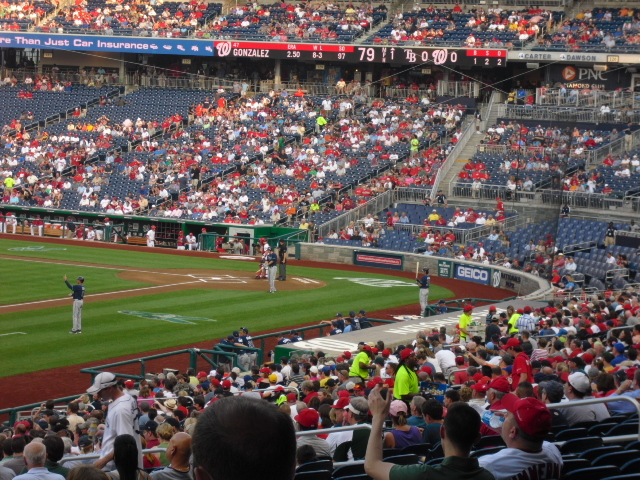 Tip: most stadiums allow sealed bottles of water upon entry, and Nationals Park has water fountains, meaning no one should ever pay for a $4.00 bottle of water at the stadium. 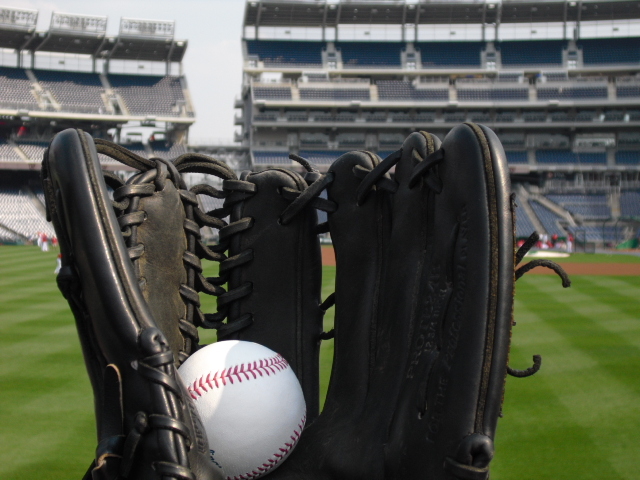 As the Nationals were wrapping up their portion of batting practice, it was right at 5:30, so I made my way down towards the home dugout to try to get a toss-up, but all the balls were left on the field for the Rays to use, bummer. However, there was a plus. 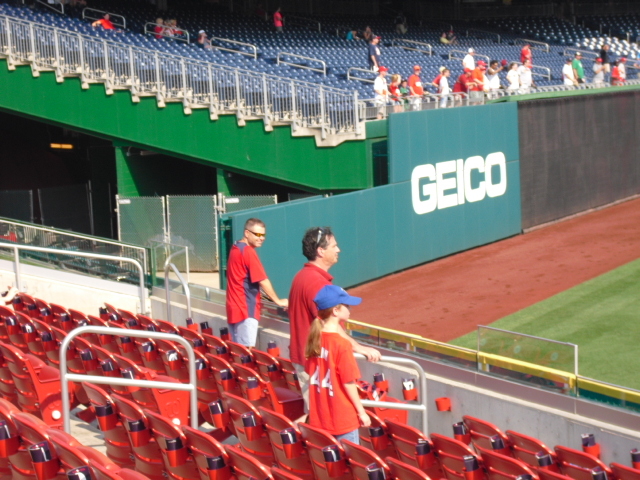 Stephen Strasburg surprisingly signed some autographs for a few fans above the dugout. He didn’t stick around for too long, but it was cool to see him sign. For the last two seasons, he would have drawn way too much attention to sign at a game, but word on the street is that this year he and Bryce Harper are both signing quite a bit. I elected to not attempt to get his signature, mostly because I already have it. 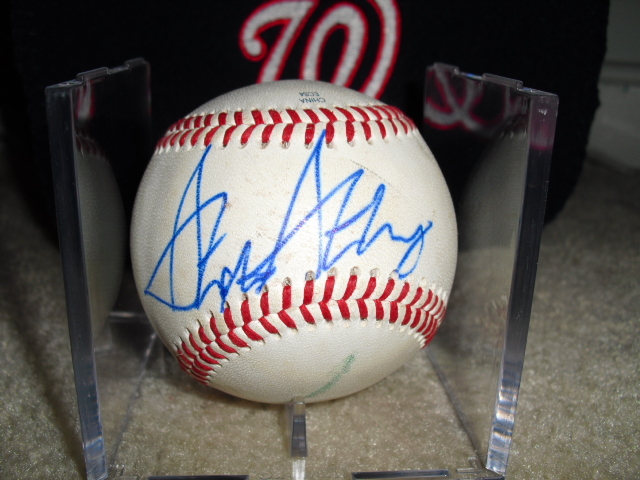 During my Spring Training trip in 2010, my dad and I saw a game in Viera, where the Nationals train, and I succeeded in attaining a Strasburg signature there. 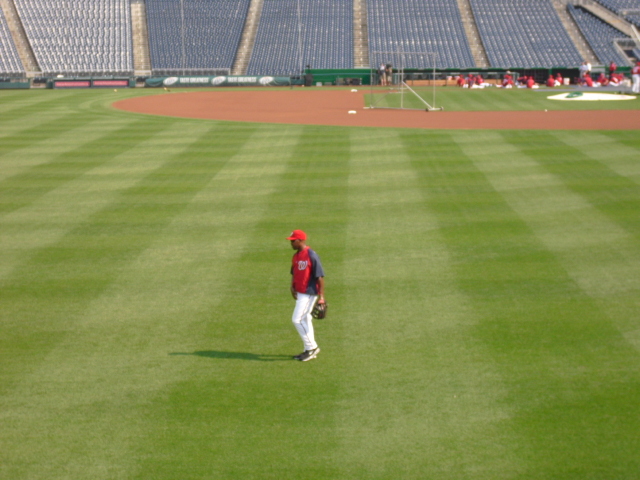 Strasburg drew a frenzy of fans when he began to sign. As for Tampa Bay’s portion of batting practice, there were very few players actually on the field. Jeremy Hellickson was the lone shagger in right field, and a few other pitchers warmed in left. Only a few batters cycled through in the cage for about a half and hour, maybe 40 minutes, most of whom were pitchers such as David Price, making for a boring snagging session. However, some were hitting home runs, mostly lefties, so I made my way to the right field bleachers. Still sitting on three balls, I really wanted one more. Things got really frustrating when Jeremy Hellickson began tossing balls to the fans in right field. I believe every fan under the age of 18 got a ball from him, with the exception of myself. And to make matters worse, the homers that did land in the seats would hit snuggly in the front row full of small kids who moved out of the way, and gloveless parents who were helpless. I did get lucky, though, as I was able to snag my fourth and final ball of the day off a home run that did indeed land in the front row (I was positioned in a wide open fifth or sixth row), but was botched by a dad (pictured in the red shirt) who tried to barehand it, and then it hit a seat right behind him and bounced up my way where a big Rays fan in front of my reached for it, but couldn’t grab it. So reaching over the row of seats in front of me, I grabbed the ball that had horrific backspin after the seat deflection. I never figured out who hit the ball, however I suspect it was Carlos Peña. As the Rays began to clear the field, David Price tossed about eight to ten balls into the right field seats, all of which he aimed at kids, and none of which came for enough back for me to reach. With the Rays’ extremely short BP over, and no players remaining on the field, I rendezvoused with my brother at our seats on the third base side. At this point it was only 6:10, and I was sweating like crazy from running around for the previous hour and a half. We got food at the concession stand called “Taste of the Majors,” a stand specializing in cuisine from cities of visiting teams. Examples: Miami Cuban sandwich, New York Pastrami, and the Pittsburgh stuffed sandwich, which I got. The choices were very unique and very tasty, differing from the boring stereotypical ballpark cuisine. I had no interest in galavanting in search of more balls once players started emerging onto the field from their respective dugouts in preparation for the game. I stayed put in my seat mostly because it was still hot, and I decided four balls for the day was enough. 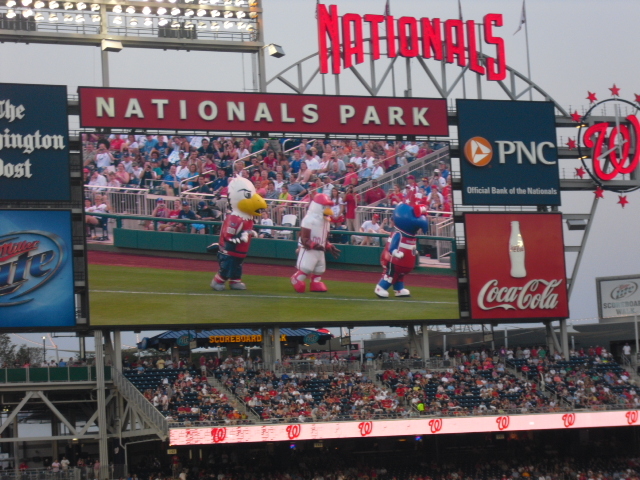 In the middle of the third inning (I believe it was) there was an extremely amusing, yet slightly disturbing display of mascot dancing. 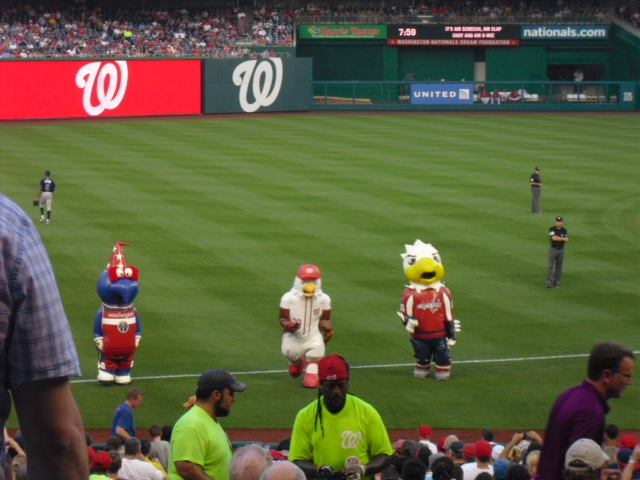 It featured blow-up mascots of three D.C. teams, the Nats’ “Screech,” the Wizards’ “G-Wiz,” and the Capitals’ “Slapshot.” There was a medley of pop songs they danced to, all too well for guys in inflatable suits. As for the actual game (you know, what I paid to see), Gio Gonzalez battled Matt Moore and the Nationals won 5-2, Gonzalez earning the win. 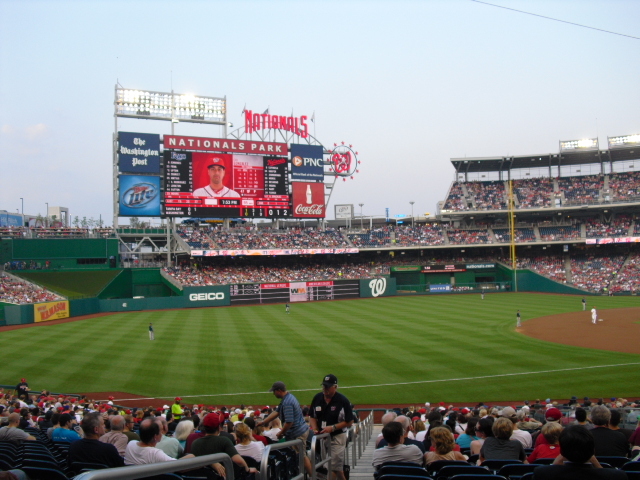 I love Nationals Park when the hometown team is doing well. That place gets hopping. The last few time I’ve been there, there have been pretty substantially-sized waves in the crowd, something there wasn’t enough energy (or fans) for in previous seasons. Danny Espinosa had a big night, going 2-4 and gathering 2 RBIs on a sixth inning double to put the Nats ahead once and for all. Even cooler was the fact that I caught an Espinosa homer in batting practice. Anyway, my brother has a driving curfew of midnight, and with our trip home between a busy metro ride and a long drive south on I-95, we needed to leave by ten o’clock to stay legal. I never want to leave games early, but the law is the law, and we rolled into our driveway just after midnight, no big deal. 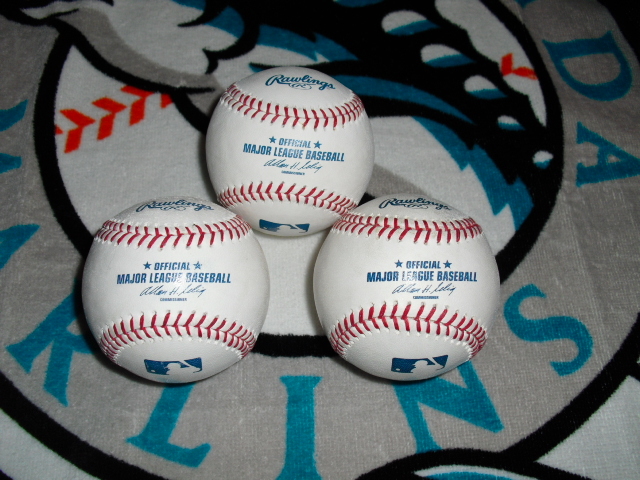 I snagged four balls at this game, three are pictured because I gave one away. Note the ball on the right that either has a misplaced stamp or strangely-aligned stitches. As a result, it has been denoted a “practice” ball by a stamp on the sweet spot. This was the first time I have seen the Tampa Bay “Rays” in person. I had seen the “Devil Rays” once previously at Camden Yards when I was about six years old. That’s really weird they didn’t let you into the right field seats. I went there right as the gates opened. Also, by the way you were snagging balls when I was there, I could’ve sworn you would end up with more than me. Well I had the two catches at the Red Porch, but other than the first toss up, I had no luck getting anything from players. I try not to beg for toss-ups too much, I prefer catching homers. Previous What happened to Jeremy Hermida?